Video inside story.Anne Lambert, who played Miranda, the girl who disappeared at Hanging Rock (1975 film called Picnic at Hanging Rock) returned on 23 February 2014 to speak to concerned environmentalists, regional residents and visitors at a Respect the Rock activism day. People who live near the rock are worried about development plans announced by the local Shire which would change the natural beauty of this place and alienate it from ordinary people and encourage over-use which would threaten the many native animals and plants that enjoy this beautiful and mysterious place. Update: Changes to comments as to who is proposing the new developments. See notes at end of article. As Ms Lambert speaks, we can hear the strong emotion she feels due to her environmental concern and personal links to the rock. She has said that people sometimes ask her if she gets sick of being identified with the fictitious character, Miranda, and Hanging Rock. She says that she doesn't. It sounds as though she feels that it gave her a unique start in life and has been a strength ever since. The film, Picnic at Hanging Rock, attracted people to her for positive reasons. Picnic at Hanging Rock was made in 1975 at a time when the Australian Government gave useful tax-breaks to Australian film, in an attempt to support Australian culture and artists. This tax-break probably was responsible for the rebooting of a languishing local film industry. As with almost all Australian industry, the Australian film industry is under stress from globalisation and many Australians seem culturally confused by globalised television and film. 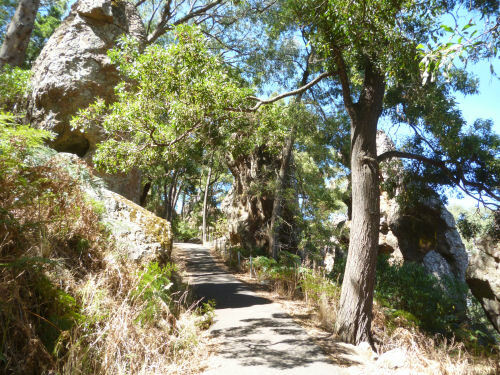 Ironically, what today's councillors at Hanging Rock seem to be proposing for the Rock is to capitalise on its qualities of a local phenomenon to attract rich international traffic. They want to build a huge convention center with deluxe accommodation on a scale that risks dwarfing the rock itself by changing it into a commercial symbol. If you listen to the other filmed speech I have now published of former Shire President, Richard Hugh, you will get a good impression of the importance of a buffer zone to keep activities around the edge of the rock to a minimum, and of the work done to revegetate and to help native birds and animals to flourish there. 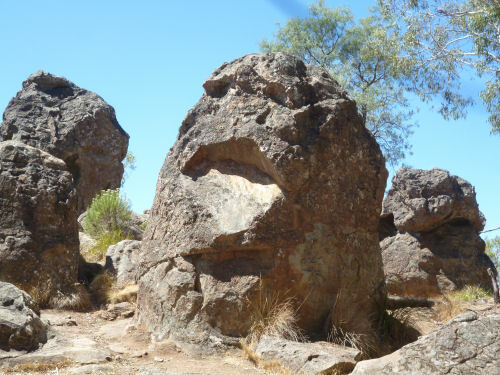 The rock itself is a wonderful natural three dimensional maze of huge rocks, many of which look like monsters with faces, and other rocks forming walls pitted with caves. Large, mature native Australian trees also flourish on the rock. It is indeed a beautiful place with its own personality and force. Time and time again we have seen big-deal developments promoted over the objections of locals. The local Liberal MLC Amanda Millar is said to be vehemently opposed to the development (as is Labor MLA Joanne Duncan), but big business has many seats in our parliaments. It is therefore necessary to keep it out of local government and to relocalise power where you can look it in the eye and speak to it. Mathew Guy, the Victorian Minister for Planning proposes to tour the site on 21st of March 2014 and locals hope he will not support the proposed changes.